Practicing social skills starts at home. It’s at home where kids imbibe good manners and bad manners and learn to tell one from the other. Paltry things like waking up and making one’s own breakfast to greeting elders with a warm are all a part of social skill set that are desired in kids from an early age. 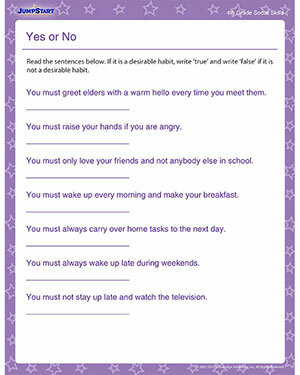 Download the free social skills worksheet for 4th grade and practice at home.